More than 50 Tarleton students from Baptist Student Ministries, or BSM, plan to spend their spring break in South Padre Island to participate in a Christian ministry called Beach Reach. ‘Beach Reach’ ministry flyer. Photo courtesy of Tarleton BSM. Beach Reach shares the love of Jesus Christ by offering free breakfast, free rides, midnight breakfast, prayer and worship, and other events throughout the week. The outreach program began in 1980 with 20 students who had “a vision to reach their peers during spring break,” according to the BSM. “Beach Reach is a great opportunity we have to serve the community that comes down to South Padre Island from all across the world,” said Warren Ethridge, assistant director of the BSM. Ethridge, who first started going to Beach Reach when he was a junior at Tarleton, has participated in the program for the past five years. 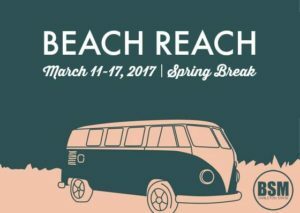 To go on the Beach Reach spring break mission trip, each student must raise $350 to $400 from friends and family members. 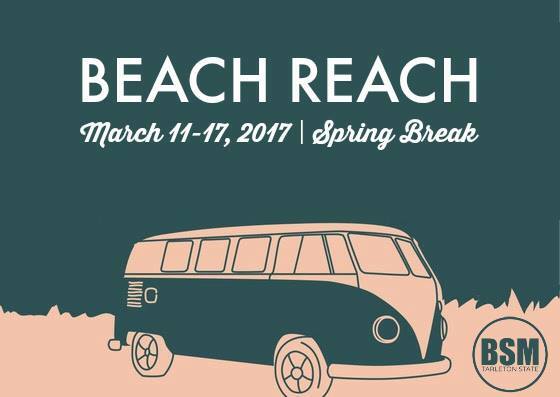 If you are interested in the spring break Beach Reach mission trip in the future, contact the BSM at 254-965-4179 for more information.